I taught how to make these cute banners for a RS craft night. I had Halloween, Thanksgiving and Christmas for them to choose from. You can use any words like BOO, BLESSINGS, JOY, etc. and of course Happy Birthday! Since I couldn't find the right size chip board letters, and I don't have a cricut to cut them out of vinyl, I bought a pack of those stick on letters for poster boards and used them to trace onto black card stock and used an exacto knife to cut them out. The entire project takes me about 45-60 minutes total. They are inexpensive and turn out adorable! Oh, I always put two extra flags one on each end more than the number of letters for the word you are using and I glue on some sort of cute picture or holiday item to make them look more festive. Here are the step by step instructions from the website I first found them at. Hope you enjoy! 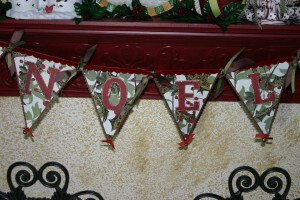 Banners and streamers add to any festive atmosphere. Make your own with patterned paper! Use paper trimmer to cut 12" x 12" cardstock in half. Each 6" x 12" piece will yield 3 individual pennants, so plan accordingly. Use a ruler to mark 6" x 12" pieces at 1", 6", and 11" at the top and 3 1/2" and 8 1/2" at the bottom. Here, a template was made with a piece of cardstock. Instead of measuring again and again, use this to mark your cardstock. Drawing lines is optional. Use paper trimmer to cut diagonally from mark to mark, cutting off outside edges first. Depending on the paper trimmer, you may be able to do two sheets of cardstock at the same time. Cut from corners to middle marking to separate pennants. Six pennants cut from one sheet of 12" x 12" patterned paper. Here, the pennants were adhered to sheets of cardstock and trimmed with scalloped scissors. Cut ribbon to double the length of the banner. Here, pennants were stapled to the ribbon. Start in the center of the ribbon to ensure even ribbon tails for hanging. Variation: Punch holes in both top corners of each pennant and either thread ribbon or add brads or eyelets to attach pennants to one another. If you're ambitious, sew pennants to the ribbon! Embellish pennants as desired. Since these were stapled, more ribbon was adhered over the staples, and then tied between the pennants. Add decorated chipboard or stamped letters with dimensional adhesive, and embellish as desired. Add more ribbon at ends of banner and display proudly!